Luis Gongora was shot a total of six times by two San Francisco police officers on April 7, moments after the officers responded to a Mission District street and confronted the homeless man who was allegedly holding a large kitchen knife. The San Francisco Medical Examiner's report released Thursday found Gongora was shot in the forehead, as well as the back of his left shoulder, his right upper back, his chest and twice in his right forearm. Blood tests found stimulants in his system, including an intoxicating level of methamphetamine. Gongora's toxicology report also notes THC and caffeine in his blood. The San Francisco Police Department typically does not comment on open shooting cases, but the department did release pieces and interpretations of some witness statements in the days following the shooting. Gongora had been in the U.S. for several years and had sent money home to his family in Mexico, according to the Guardian's in-depth report on his life and death. On Shotwell Street, where he was killed, he was known as a member of a homeless camp who collected bottles and cans and often kicked a soccer ball up and down the block. Gongora's death came about five months after the fatal police shooting of Mario Woods, which saw the beginning of an effort to depose former SFPD Chief Greg Suhr, and about six weeks before the fatal shooting of Jessica Williams. Suhr resigned hours after Williams' death. 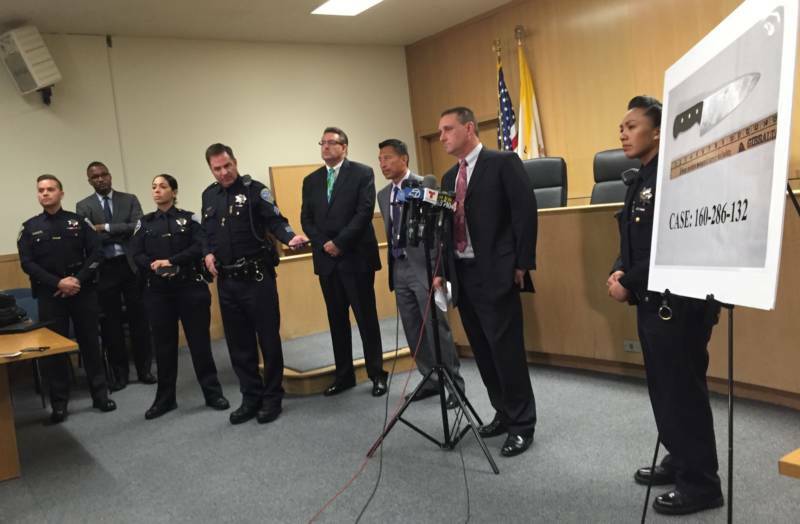 Surveillance video originally published by SFGate showed two officers, later identified as Sgt. Nate Steger and Officer Michael Mellone, move out of the camera's frame as they shout commands to "get on the ground" and "put that down." One of the officers started to fire beanbag rounds from a pump-action shotgun, then the other started shooting his firearm. The entire interaction, from first command to final gunshot, played out in less than 30 seconds. Suhr said at a townhall meeting a week after the Gongora shooting that he had emphasized fostering "time and distance" when officers encounter erratic suspects with knives, and that "there'll be a lot of questions about tactics on why that didn't happen." Civil rights attorney Adante Pointer is representing Gongora's family in a legal claim against the city, an initial step toward a lawsuit, which Pointer said is coming "sometime in the near future." He said some of the wound trajectories indicate officers were behind Gongora when they fired. He said the shot to Gongora's forehead, from front-to-back, but with a downward trajectory, indicated "that Mr. Gongora was either on the ground or on his way there, which would have rendered him not a threat." On bruising from the beanbag rounds, Pointer said "some of them were from the rear, which means that he was not charging or lunging at them when he sustained these shots." He said both the toxicology results and a discussion of Gongora's low-level criminal history were irrelevant to officers' decision to shoot. "That's just a shameless attempt to besmirch this man's character in the eyes of the public," he said.